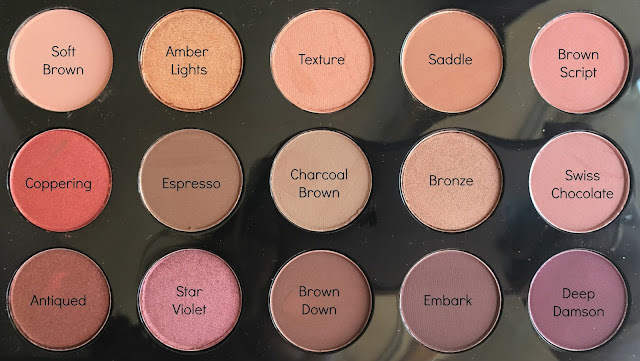 I've been picking up a MAC eyeshadow here and there for years - I've repurchased many and I've retired many too as my eyeshadow tastes have developed. I wouldn't say MAC eyeshadows are the best eyeshadows in the world by any standard but there are definitely a fair handful of amazing, iconic shades in the MAC lineup. 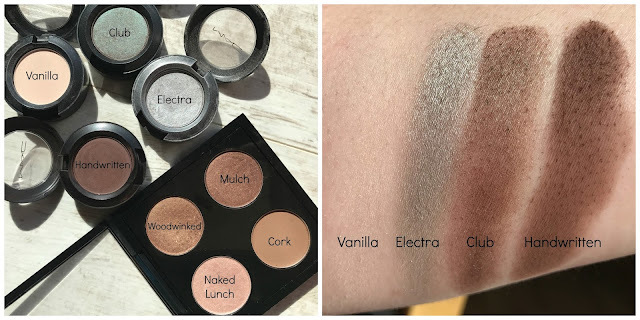 Up until quite recently, I think a single pan eyeshadow was €12 but Brown Thomas recently slashed the price of single pan eyeshadows to just €7, so I thought it timely that I swatch some shadows and show my beloved readers what I rate and what I hate in the MAC eyeshadow world so far. I think most of the colours are available in Ireland also - I've picked some up in the US, the UK etc. over the years. 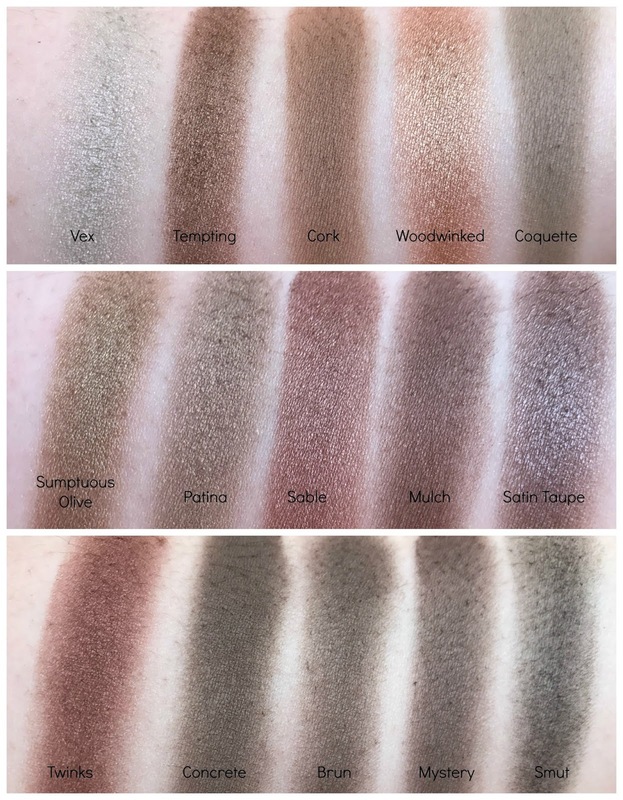 The vast vast majority of the shadows below are all some degree of neutrals but that's because I wear neutral eyeshadows 99% of the time and I've invested in what I know I will get the most use out of. MAC eyeshadows come in several different finishes - matte, veluxe pearl, velvet, frost, satin, lustre - and I think they have around 110 individual shades in their permanent single eyeshadow line. The pigmentation and ease of use varies across the finishes - I'm a big fan of the veluxe pearl shadows and the velvets are my least favourites. 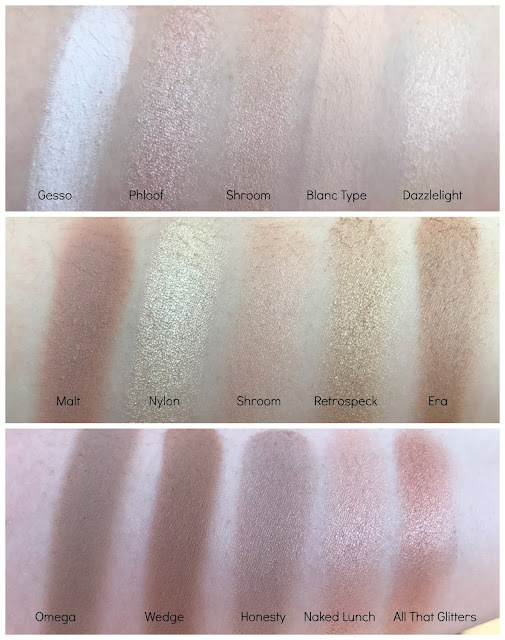 Some of the lustre shadows can be very poorly pigmented also and, as you will see below, the mattes are either amazingly pigmented or poor and washy. For that reason, I've put the finish in the description of each of the shades below, as well as the official description of the colour from MAC (where I think their description was misleading, I will let you know). It's taken me a few years to accumulate these shadows and I've gone through multiple pans of several colours over the years. I've got 1 x 30 pan palette (the double-sided one packed with neutrals), 2 x 15 palettes (warm tones and cool tones), 1 quad with four of my most used colours and four single shadows that I have yet to depot. My double sided MAC palette is probably my most used item in my makeup collection - in my line of work, I don't get the opportunity to experiment with colours very often and though this palette might look boring, it houses some of my most loved and most used shadows. Enough blather out of me - now on to the swatches! Gesso is a matte finish shadow and is described as a vivid white and I couldn't agree with this description - it's a stark white, extremely brightening and the matte formula on this is dreamy. Phloof is a frost shadow and is described as a frosted off-white - I would qualify this by saying it leans towards the pink/purple spectrum under a certain light. This is quite nice on the inner tear duct. It applies nicely. Shroom is a satin shadow and is described as a soft beige with shimmer. I love this shadow so much I somehow ended up with two in my palette! I love wearing this on it's own with a simple colour in the crease like Cork blended out to oblivion for a simple, no-fuss eye look. Shroom was one of my first MAC eyeshadows and I will keep on repurchasing it. Blanc Type is a matte creamy beige shadow, similar to Urban Decay Virgin. It's a good colour to apply before any other shadows as I find it brightens and neutralises any discolouration on my eyelids. Dazzlelight is a veluxe pearl shadow (one of my favourite MAC eyeshadow finishes) neutral beige with shimmer. I don't find myself dipping my eyeshadow brush into this one very often because I would almost always pick Shroom over it. Malt is a matte shadow described as a soft pinkish-beige - let me tell you, this is one seriously underrated eyeshadow in my opinion. I love this in the crease as a transition shade, it looks great on it's own or with any darker/bold shades. It's quite cool so it looks shadow-esque and very flattering. It also looks great on it's own on your eyelids blown out into the crease with some killer mascara. Nylon is a frost finish shadow and is described as a pale gold with icy shimmer. I bought this with the intent of using it as a brow highlight but it's too gold for my skintone. I sometimes put this in the inner corners of my eyes or dab a little on my crease when I am doing a burgundy/cranberry eye look - I like the contract of the frosty gold against a burgundy shadow like Makeup Geek Bitten. Retrospeck is a lustre shadow and the shade is (bizarrely) described as "beached blonde". This is a great one eyeshadow wonder which surprises nobody more than me because it is a lustre finish after all. Era is a satin eyeshadow and is described as soft golden beige with shimmer - this is definitely more of a light brown than a beige shadow in my mind but it's a really nice shadow and easy to work with. Omega is a matte shadow and described as a soft muted cool beige-taupe - I'm not sure if it's the coolness of this shadow or not but I love this in the crease. I know loads of fair haired folks use this in their brows also so if you've blonde eyebrows, this might be a good brow pick for you. Wedge is a matte shadow and described as a soft muted warm beige taupe. What you see is what you get with this shadow. Honesty is a lustre shadow and is described as a muted bronze - I would say this is more of an antique bronze because it is quite cool. I never find myself reaching for this shadow even though the pigmentation is remarkably decent for a lustre shadow. Naked Lunch is a frost eyeshadow and described as a minimal pink with shimmer - I don't get pink vibes off this but it is one of my favourite MAC eyeshadows - so much so I have it in this palette and in a quad palette that I put together to bring with me when I'm on the go. All that Glitters is a veluxe pearl shadow which means the formula is divine and this colour has been described as beige with gold pearl - beige just seems too ordinary a word to describe this. 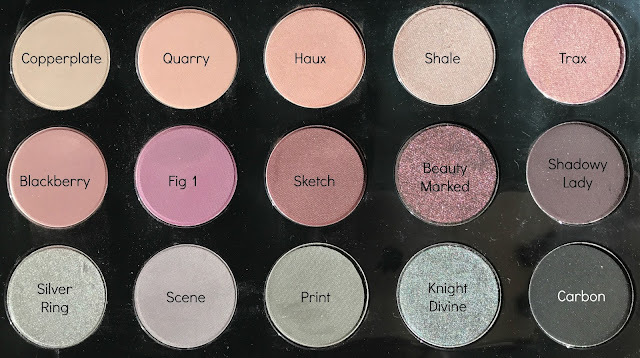 This is a shadow that goes with every other colour - pinks, purples, browns, blues, greens - if you don't already own this, I think you should consider rectifying that stat! Vex is a frost shadow and described as a beige with pink-green pearl - in my eyes, this is more of a grey than a beige shadow, and I don't pink up on too much pink/green undertones to be honest. I very rarely use this shadow. Tempting is a lustre shadow and is described on the MAC website as a sinfully rich cocoa - it's more of a rich caramel shade than rich cocoa in my opinion. Cork is a satin shadow and described as a muted golden-brown. I love this not just because it's called after my homeland but because it's one of my most loved and most used crease colours. It's not too warm, not too cool, not too light and not too dark. It's a must have and I happen to have two. Woodwinked is a veluxe pearl eyeshadow described as a warm antique cold and this is one of MAC's eyeshadows that has achieved legendary status already so there is not much more I can add really other than to say that this is an incredible colour irrespective of your eye colour, it looks expensive and rich and because it's a veluxe pearl. the finish is incredible. This should be the top of your MAC eyeshadow wishlist if it's not already. Coquette is a satin shadow and described as a muted greyish-taupe shade. It's a useful mix of mid-tone grey and brown and goes with a multitude of other colours. Sumptuous Olive is another veluxe pearl shadow so it's bound to be a good'un and this shade is described as a khaki with pearl. I very rarely use this shadow as it's a little greener than what I am used to and that intimidates me a smidge but this is a favourite for many, particularly green-eyed gals. Patina is a frost shadow and another one of my favourites, described as a taupe brown with golden pearl. I've never come across another shadow like this. I love this all over the lids on it's own. Mulch is a velvet shadow described as red-brown with bronze pearl - I feel like the pearl is more obvious in the pan than it is swatched but this is still a lovely shadow. Satin Taupe is a frost shadow and one of MAC's most famous shadows in my opinion. It is described as a taupe with silver shimmer but I feel like that's too simple a description for a colour so rich - sometimes it looks purple to me, sometimes brown. It's a great shadow to have in your collection because it just does so much. Twinks is a veluxe pearl eyeshadow described as a deep plum with pearl - I think it's more of a deep plummy brown than a deep plum but that might just be splitting hairs. Concrete is a satin shadow and described as a muted taupe brown - I rarely use it granted as I feel like it just looks dirty on my skin. Brun is a satin shadow and described as a muted blackish-brown - this shadow is so muted, it might as well not exist. I find it hard to build up on the eyes, hard to get a decent swatch for this post, I don't think I even try to use this anymore. Mystery is a matte shadow and described as a cool brown and that's pretty accurate, a cool dark brown. This is a great dark option for a brown smoky eye and can be used with pretty much any other colour to smoke it out. Soft Brown is a matte shadow and described as a soft golden peachy brown which is the perfect description. This colour is a dream to work with, easy to apply, easy to blend. Amber Lights is a frost shadow and described as a peachy brown with shimmer - it's not vivid enough to be a coral but by no means boring enough to be a brown. I love this shade and I feel like it doesn't fully get the love it deserves. Texture is a velvet shadow and again, is described as a peachy-brown with shimmer. It's lighter in tone than Soft Brown and reminds me a lot of the MAC ProLongwear eyeshadow in Uninterrupted which has now sadly/inexplicably been discontinued. Saddle is a matte shade and described as a golden orange brown - this eyeshadow makes blue eyes sing, it's so incredibly flattering against blue eyes. 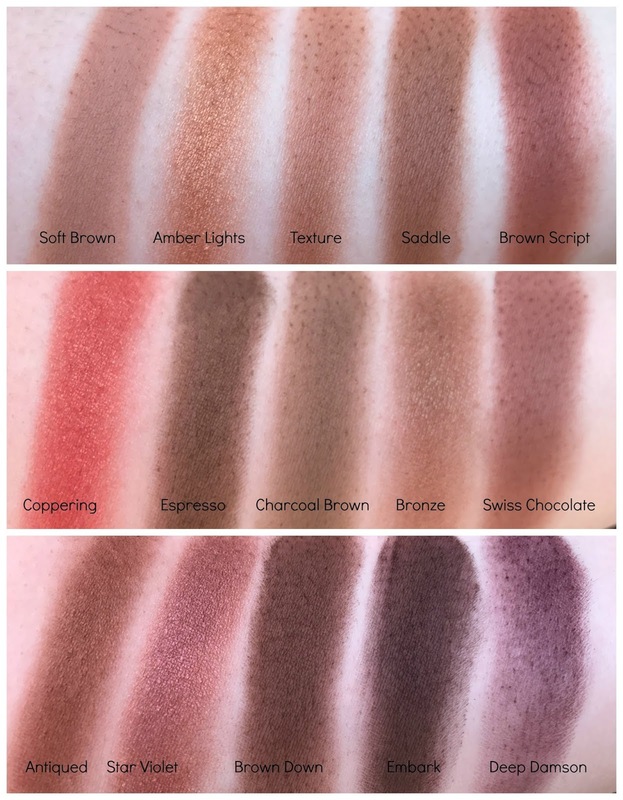 Brown Script is a matte shadow and described as warm chestnut brown - I find this eyeshadow is a great alternative to when I want a really warm eye without using a burgundy or pink eyeshadow. Coppering is a veluxe pearl shadow and a super vibrant orange copper shade. I love it in my palette but barely use it because I am so intimidated by the brightness of it but this exercise has made me mentally note that I need to try to incorporate this eyeshadow. Espresso is a matte shadow and described as a muted golden brown but I don't find it to be too golden - it's a neutral brown in my mind - not too warm and not too cool. Charcoal Brown is a matte shadow and described as a muted taupe brown - this is another one of my favourite crease colours. Bronze is a frost shade described as a gold brown with gold-bronze shimmer - I admit that I was a little disappointed with this colour when I first purchased it as it's not the most pigmented and I don't reach for it very often. Swiss Chocolate is a matte shadow described as a muted reddish brown and is a gorgeous crease colour. It reminds me of Makeup Geek Cocoa Bear. Antiqued is a veluxe pearl shade and described as an ash brown with bronze - I don't think there is anything ashy about this shade but it is a beautiful shade. Star Violet is a veluxe pearl shade and described as a pinky-brown plum - I would add a bit of purple to the mix on that. This colour is a testament to what MAC do best - so many undercurrents and tones and colour combinations emanating from one single shadow. Brown Down is a veluxe shadow and described as a teddy bear brown - it's light enough to blend out well for your crease but dark enough to pack on to the outer corners of your eyes. Deep Damson is a matte shade (though you wouldn't think it to work with it because it's hard and difficult to pick up) and is described as a deep burgundy. It's a pity this eyeshadow is so poor because the colour in the pan looks so promising. Copperplate is a matte shadow and described as a cool taupe. It looks particularly gorgeous with purple and mauvey toned eyeshadows. Quarry is a matte and is described as a soft muted plum brown shadow. This is one of my top 5 MAC eyeshadows without a shadow of a doubt. I love a cool mauvey eye and this colour is exquisite. Haux is a satin shadow and not one I hear a lot about at that but it is described as a soft muted rosy brown. It reminds me of my favourite Makeup Geek eyeshadow Cupcake and I love putting this in my crease. Shale is another satin shadow and is described as a mauve plum with shimmer. I don't notice much shimmer when I use this colour and it barely gets a look in to be honest because I'm just too fond of Quarry and Haux. Trax is a velvet shadow and described as a burgundy plum with shimmer - a description which is too kind because this colour honestly doesn't look like much of anything - it swatches terribly and is so difficult to work with. Blackberry is a matte shade and is described as a muted burgundy-plum brown - it swatches and applies darker than it looks in the pan but it goes so nicely with Quarry. 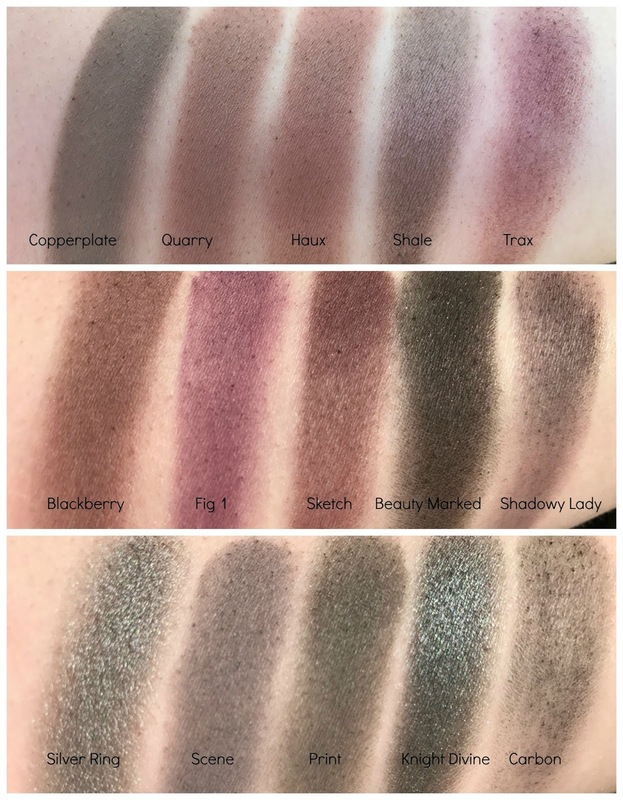 Fig 1 is a matte shadow and is described as a cool plum shade - I have really not heard anything about this shadow anywhere but I liked the look of it so I picked it up and I'm so glad I did because it really is something special, even for me who is stuck in a neutral eyeshadow comfort zone rut. Sketch is a velvet shadow (which, if you haven't copped by now, means it should be crap) and is described as a burgundy with red shimmer. I get more purple vibes than I do burgundy vibes when I use this shadow but again, I love pairing it with Quarry or Haux. Beauty Marked is a velvet and is described as a black with red sparkle - as you can see it looks very sparkly in the pan but when swatched, it's blacker than the matte black MAC eyeshadow (we'll get to that). It's a lot darker than I expected so I don't use it very often. Shadowy Lady is another example of a very poor matte shadow and is described as a blackened plum. I've just given up on this - it's far too hard to work with because the brush just does not pick up product. Silver Ring is a veluxe pearl eyeshadow described as a grey with silver sheen. I don't often do silver smoky eyes anymore if I did, this would be my go-to silver eyeshadow. The pigment and wear of this is incredible, I just need more excuses to use it. Scene is a satin finish eyeshadow described as a muted blue grey - this is a great colour for a cooler subtle smoky eye as it's not too dark. Print is a satin finish shadow and described as a muted grey with shimmer - there isn't too much shimmer to it in my mind but I'm pretty fond of grey eyeshadows and this one is right up there. If you're looking for an alternative to black, definitely consider this one. Knight Divine is a veluxe pearl shadow and described as black with silver pearl. This eyeshadow, in my humble opinion, is seriously underrated. It's a gorgeous, packed with pigment silver over a dark base and looks great in the centre of the lid over a grey smoky eye. Carbon is supposedly a matte finish shadow and is described as intense black but as you can see from the swatch about, it's absolutely rubbish. There are way better matte black eyeshadows out there so this is one I would definitely recommend skipping. Lastly but by no means leastly, the remainder of my MAC standard single eyeshadow collection comprise of 4 single shadows and a 4 pan palette with some of my absolute faves. I don't propose talking about the latter as I have already given my two cents on those shades but I will quickly run through the single shades in my collection. Vanilla is a velvet finish shadow and described as a peachy-ivory with reflects. This shadow, like most of the velvet shadows, is very poorly pigmented and barely shows up at all on my lids. Electra is a frost shadow and is simply described as a silver. This was one of my very first MAC shadows and I've gone through a few pans in the last 10 years. I have cool colouring and blue eyes so I like silvers and greys and this one is just the right shade for me. Club is a satin shadow and is described as a red brown with green pearl but it really swatches more like a brown. I was hoping this would be a duochrome shade but, even though it looks green/red in the pan, it swatches as a warm brown, and so I'm a little disappointed by it. It's grand but I've never felt inclined to depot it and put it into a palette and I just don't find myself reaching for it. Handwritten is a matte shadow and described as a neutral brown shade. I can't remember why I bought this and admittedly I very rarely reach for it but it's a decently pigmented, rich reddish brown shade and I will definitely try to incorporate it into some eye makeup going forward. So there you have it - my single MAC eyeshadow collection in it's entirely. This was a long post and if you've stuck with me to the end, you deserve a medal. 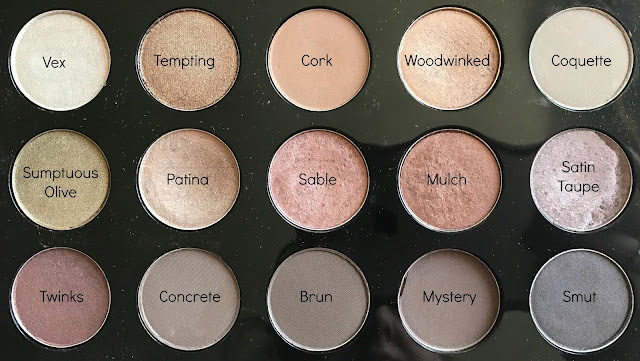 As I mentioned in the beginning, I know my MAC eyeshadow collection is very neutral heavy but thats's just because neutrals have a special place in my heart and I don't veer away from them very often. I hope this post was useful for those of you looking to avail of the price slash on single MAC eyeshadows - I know I'll be picking up a few more before long! On that note, if you have any colour recommendations, let me know! 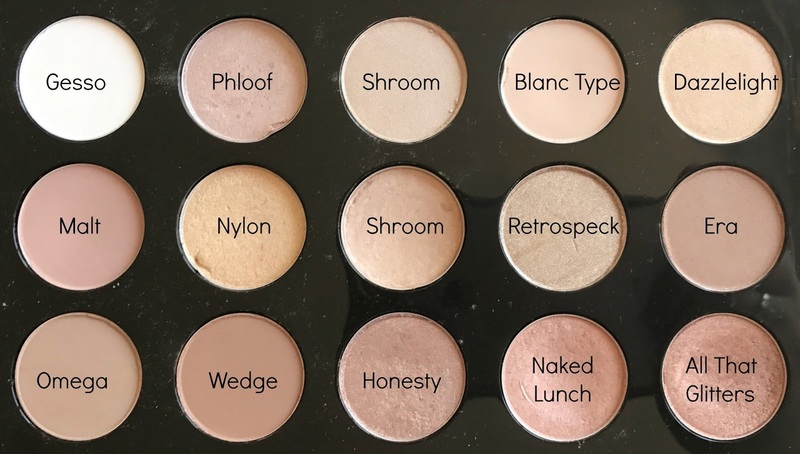 As a matter of interest, what's your favourite MAC eyeshadow shade?